Eternal source of light divine was written (but perhaps not performed) for the birthday of Queen Anne in 1713. 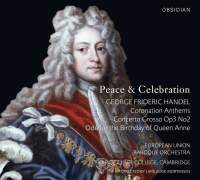 The Ode was paired before with Handel’s four anthems for the coronation of George II (1727) in a memorable recording by the Choir of King’s College, Cambridge, and the Academy of Ancient Music (EMI, A/01), but this repeat prescription is justified because of the refreshing spontaneity of this warts-and-all live recording made last year at St John’s Smith Square. Clare College Choir are excellent in every technical respect and there’s no hint of posturing clichés: their exclamations of ‘God save the King!’ during Zadok the Priest seem more like a statement of confident hope than mere bombast. Plenty of directors know what to do with Handel’s trumpets and drums in D major but Lars Ulrik Mortensen comes into his own in the contrasting middle sections: the plaintive oboes and hushed strings in the middle section of Let thy hand be strengthened (‘Let justice and judgment’), the gorgeous ritornello of ‘Upon thy right hand did stand the Queen’ (My heart is inditing) and the affectionate gracefulness of ‘Exceeding glad shall he be’ (The King shall rejoice) are all moulded sublimely. The Purcellian rapture of the Ode’s first part is captured by trumpeter Sebastian Philpott and countertenor Alex Potter; in the following sequence of numbers Mortensen and his youthful crew radiate the courtly joy of Handel’s first English-language masterpiece. EUBO also perform Op 3 No 2; their rapturous dialogue between two cellos and solo oboe in the Largo puts some more experienced Baroque bands to shame.